November: we have a winner!! Every two years we have a Student Composer Competition. We are happy to announce that the 2009 winner is Yi-Wen Chang. We will give the world premiere of her piece (whose text is a Sung Dynasty poem by Xin Qiji) at the final concert of our National Youth Choral Festival on March 29 at Davies Symphony Hall in San Francisco. We'll sing it along with the 250 high school choral singers who will participate in the three day festival. 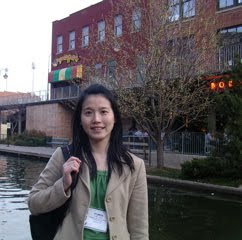 Yi-Wen Chang received her bachelor degree in music theory and composition from National Taiwan Normal University, and a masters degree in choral conducting at the College-Conservatory of Music, University of Cincinnati. Currently she works as a music teacher in a junior high school in Taipei, Taiwan and as the music director in her church.